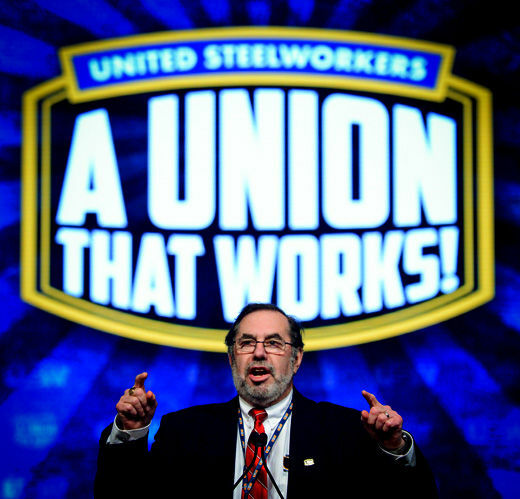 LAS VEGAS (PAI) — Steelworkers convention delegates adopted a multi-point action platform for their union for coming years to battle what re-elected President Leo Gerard called “shrewd, greedy and powerful” forces out to destroy workers. The plan was touchstone of the 4-day convention, in Las Vegas, August 11-15. The platform calls for the union, which represents workers in steel, oil, rubber and plastics, chemicals and other industries, to fight continually for jobs with family-sustaining wages and to reduce income inequality. Reducing inequality “is at the core of rebuilding our economies.” the delegates said. 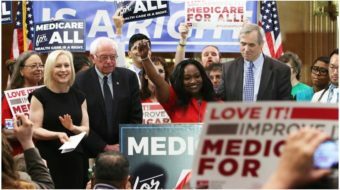 But the entire action plan, and other gains workers have made, are at risk in U.S. elections this fall, Gerard warned delegates in a hard-hitting keynote address. “These powerful forces intend to destroy collective bargaining, to pauperize working people and permanently elevate the wealthy,” he warned. The political battles will be nationwide, but the union will especially target organizing the anti-union, anti-worker South, Gerard said. 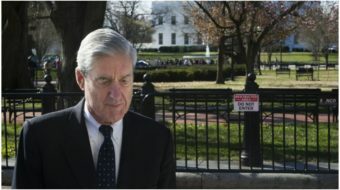 Doing so “is crucial because the only way to change people’s minds about the value of unions is to share their vision for a better life and offer them a way to achieve it.” New ideas for organizing the South – and elsewhere – must come from “the energy” of rank-and-file members, he added. On economics, the delegates decided USW will push to rebuild a strong manufacturing base for more economic stimulus programs in both countries. The stimulus programs should concentrate on investing in infrastructure, education and technology. The union will also campaign to repeal former GOP President George W. Bush’s tax cuts for the rich, and for further re-regulation of the financial sector. The financiers’ finagling, aided by Bush’s policies, caused the Great Recession, also known as the Bush Crash. Delegates also decided USW would work for fair trade deals that include enforceable worker rights in the treaty texts, bans on child labor, illegal subsidies, sweatshops and foreign currency manipulation. All are unfair trade practices, USW said. Better health care and retirement security are also top USW goals. Absent from the overall resolution, however, was USW’s – and Gerard’s – frequent and strong commitment to government-run single-payer national health care, which Canada now has. Gerard, an Ontario native, has often spoken about how U.S. health care costs force union negotiators to forgo other gains, such as raises. And the union strongly backed public sector workers, including USW members. Delegates said USW will lobby “to ensure that all levels of government are properly financed and empowered to ensure quality public services and education; provide effective regulation of our workplaces, marketplaces and economies; and protect us from environmental degradation. “Governments at all levels have important roles to play in providing essential services, defending the vulnerable, encouraging environmental sustainability, facilitating economic growth and ensuring a fair and just society,” the union platform said. But that just and fair society won’t occur “as long as our economic policy puts the interests of corporations before the interests of working people,” it adds. “Corporate short-term profiteering and financial speculation will jeopardize our economic future,” the action plan says. Gerard was even blunter about the 1 percent. To enhance those drives, the USW plans to “increase our public profile as a growing progressive union” in communities through pro-worker, pro-public activities such as sponsoring food banks and urban gardens, joining public policy campaigns, working with Habitat for Humanity and building a speakers bureau to teach students about the role of unions. And it decided to undertake an unspecified restructuring of its headquarters staff to better help both locals and regionals in organizing. That includes a Canada-wide organizing drive. USW will also “place enhanced resources” – more money – in organizing drives in larger bargaining units. And it will step up internal organizing in shops it represents, but where not all the workers are union members, notably in “open shop” states. Besides Gerard, speakers included House Minority Leader Nancy Pelosi, D-Calif., and Tom Mulcair, leader of Canada’s progressive New Democratic Party (NDP). Canada will hold a parliamentary election next year. The GOP holds the U.S. House 234-199, with two vacancies, while Democrats hold the Senate 53-45 with two pro-Democratic independents. But the Democrats are defending 21 of the 35 Senate seats up this fall, putting the pro-worker majority at risk. And other than Pelosi and her congressional allies, few analysts expect the Democrats to retake the House. Photo: Leo Gerard speaking at convention. United Steelworkers flickr, August 12 © All rights reserved .